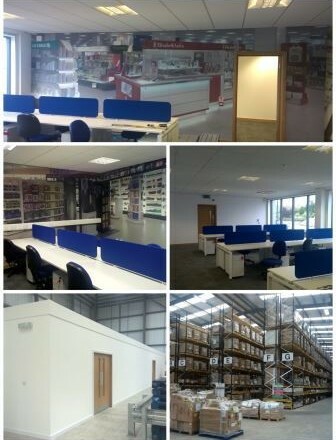 Woodgreen completes a project for Boots at the Normanton Consolidation Centre. This scheme was a fast track, all-encompassing refurbishment of the existing warehouse and offices in order to meet the requirements of the new occupier. The works comprised the installation of a full warehouse racking system which included lighting change to align with the height and location of isles, create new FLT charging area, refurbishment of the office area along with creating a new meeting room in the warehouse area. The restrictive working space and restrictions inside and out of the store, necessitated an attentive approach to the phasing and coordination of the works.